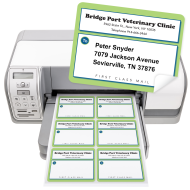 Make a great impression with custom mailing labels. Use them to personalize everything that leaves your office and you will reap the benefits of brand awareness. 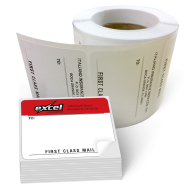 Quick and easy to use, promotional mailing labels are a time-proven and affordable advertising tool. Our pressure-sensitive labels are printed on smooth matte finish paper stock and are available on 6-up laser style and roll formats. Presentation has always played an important role in any business' road to success. 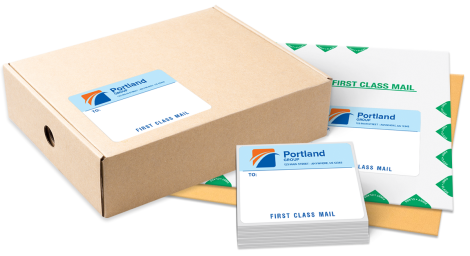 Using custom mailing labels seems to be a small detail, but when it comes to leaving a big impression, no detail is too small. The value of having a personalized branded presence as part of all your mailings is immeasurable. Personalized shipping labels are a must-have branding item that will give your correspondence a finishing look that will tie in with your business' personality.